Artwork by ROA, shot by Martha Cooper. My favourite mural of the I ART Joburg series. Our Saturday walk included a stop at the Mai Mai Market that inspired ROA’s endangered Rhino installation displayed at Area3. After a two month hiatus spent in my study (and a number of free WIFI-enabled coffee shops across the city including my current favourite Warm & Glad, on 357 Jan Smuts Avenue) finishing my M.A. dissertation, I have been released to feast on the city. Oh how I have missed that. On Saturday we took a walk with Bongani Mathebula from MainStreetWalks to view the murals that form part of the IARTJOBURG project, a brilliant initiative by Ricky Lee Gordon of /and people (love their work), adidas Originals and Plascon. If you go down to Doornfontein today you are in for a big surprise. 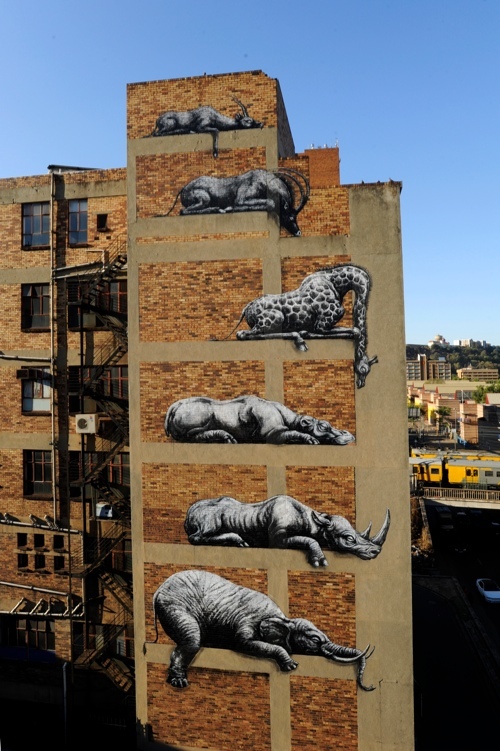 Look up along Sivewright Avenue as you travel in the direction of Yeoville and there hanging on the wall of an otherwise ordinary commercial face brick block is an elephant, a rhinoceros, a giraffe and three other wild creatures. They appear to be lying across the reinforced concrete beams, their limbs hang limply, and their eyes are closed. Asleep, or extinct, the artist has left it up to you to decide.